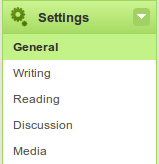 If you’re referring to the title of your blog /site, you can change it in Settings → General in your blog’s dashboard. If you want to change your blog’s URL, we advise you to create a new blog with the desired URL and then use the Export / Import functions to transfer the content from one blog to another. Please note that custom domain names can not be changed.